Since the beginning, Cloud Imperium Games has always been vocal about the idea of building our games with the support and input of our community. This accounting for the years 2012 to 2017 is in line with our policy of openness and transparency and intends to share how the company has grown based upon what we have received during this period and the work required to meet the demands inherent in such an undertaking. Generally, we have tried to make the Accounting as easy to read and informative as possible. It is not set out in a standard financial statement format but is instead focused upon the trading position of the Group following a cost accounting basis. Therefore, it does not go into intricacies of revenue recognition, working capital management or other funding or financial instruments. This format will show our net receipts (which are gross receipts less VAT/Sales taxes) on an ‘as received basis’ and associated costs on an ‘as incurred basis’. We add capital expenditure to these trading costs, which is a naturally large item for a growing technology-based business. Our auditors have reviewed these numbers and verified the approach we have taken, tracing the numbers herein to our tax returns and financial statements (the latter also being publicly filed in the UK). The above table sets out our revenue sources and is divided into three main categories. This line shows the net receipts from our backers and customers as they are also reported in real time on our website counter. We have used this number because it will be familiar to many readers who follow our progress regularly. Due to exchange rate differences and small items that do not feed into our website counter, it does not represent our total revenue received. Other than subscriptions (referred below), the differences are included in the Other income line. The subscriptions line shows our subscriptions revenue using standard exchange rates. Again, any differences due to exchange rate movements will be accounted for in the Other income line. The Other income line represents income from partnerships with various hardware and software vendors, sponsorship income and various local incentives which we receive based upon the nature and location of our development and production activities. It also includes any exchange differences as referred above. What the income line shows clearly is the initial explosion in revenue upon launch at the end of 2012 and into 2013. Since then, revenue has grown more steadily from 2014 and into 2015, with ‘counter’ income at and around $35M per year since then, depending upon release frequency and timing of ship sales and releases each year. Other income has grown to be a substantial and important part of our funding since 2015. 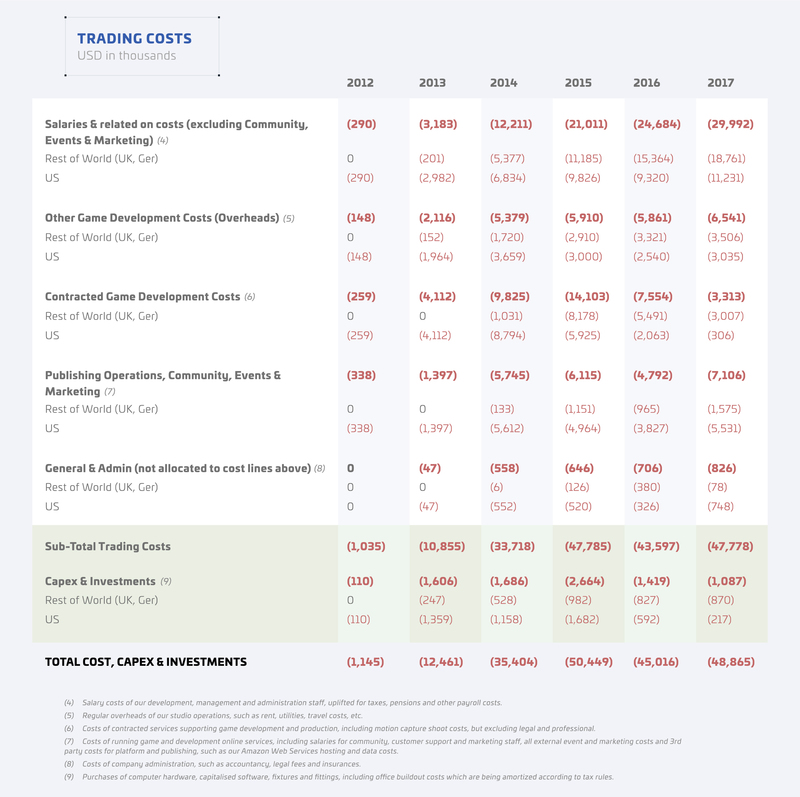 Trading costs are broken down by territory and year into five broad categories. Salaries and related on-costs represent the total people cost of all employees within the Group, except Community, Events and Marketing personnel – whose salaries and related costs are included within that relevant cost line. As can be seen from this cost line and the headcount numbers also reported, is that the Group started in the US in 2012, with the Rest of World only starting in Q4 of 2013. However, by 2015 headcount and related salary costs in the Rest of World development team had surpassed the US development team and by the end of 2017 represents three-quarters of the development personnel. The growth in the Rest of World operations is a consequence of planned expansion in lower cost territories whilst mindful of the overall efficiencies within the teams and Group as a whole. There was a big growth, particularly in UK operations, in 2015 that continued into 2016, whilst the US rationalized some of its development resources, redeploying some into other operations and locations as the Group transitioned to its new more cost-effective structure. These are the costs of operating the various studios of the Group. In addition to office costs, expensed IT, travel and accommodation, and legal and professional fees are also included within this category. This analysis shows these costs have increased in stages representing the growth in headcount and office space and locations, with the main growth in the US in 2014, leveling off and even falling back since then. The acceleration in the Rest of the World costs was in 2015, edging up slightly since then with the gradual increase in the size of the Rest of World operations, although such overhead cost growth has been disproportionate to the growth in headcount, reflecting the efficiencies we have been mindful of whilst considering our expansion planning. Whilst the overhead cost category is relatively steady and grows with the size of the Group operations at each studio, it can also fluctuate based upon activities of the Group which are not directly related to a specific location. These represent the costs of contracted services used to support the game development work. 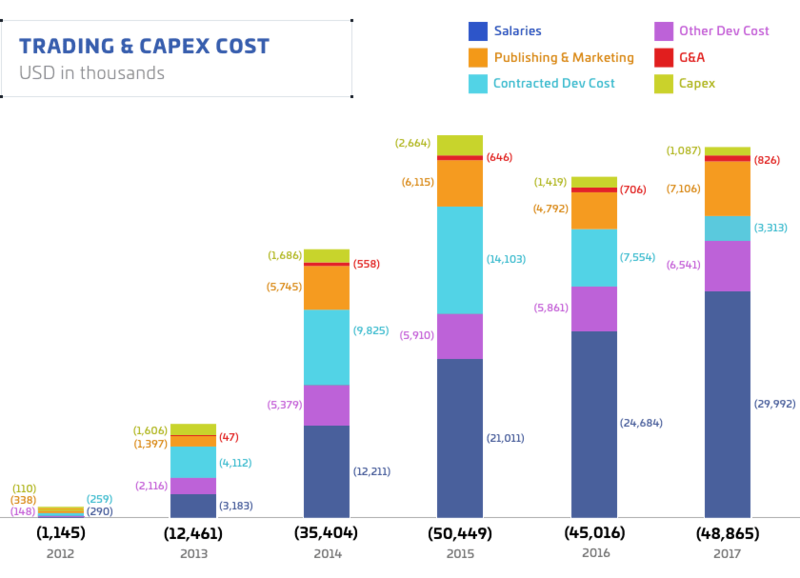 As a single cost area, this demonstrates the maturing of our development operations over the years. During the first couple of years after the initial campaign, the most efficient way to deliver to our community was through outsourcing, buying in technology and development resource to supplement our relatively small US-based internal team. Meanwhile, as planned, we built up our internal teams and studios, adding the UK towards the end of 2013 and soon reached the point where that became the most efficient way of delivering the extended scope and bespoke features our audience required, and thus we began to cut back on our third-party development represented in the significant fall off in US contracted game development costs from a height of $8.8M in 2014 down to only $0.3M by 2017. The Rest of World costs in this area are slightly different in nature representing ad-hoc services in various disciplines contracted in and managed by the internal resource of the Group, but that number is then amplified by camera, stage rental, shoot and actor costs relating to the star-studded storyline narrative for Squadron 42. That work substantially contributed to a spike in Rest of World Costs in 2015 and 2016, before its influence became less prevalent by 2017. 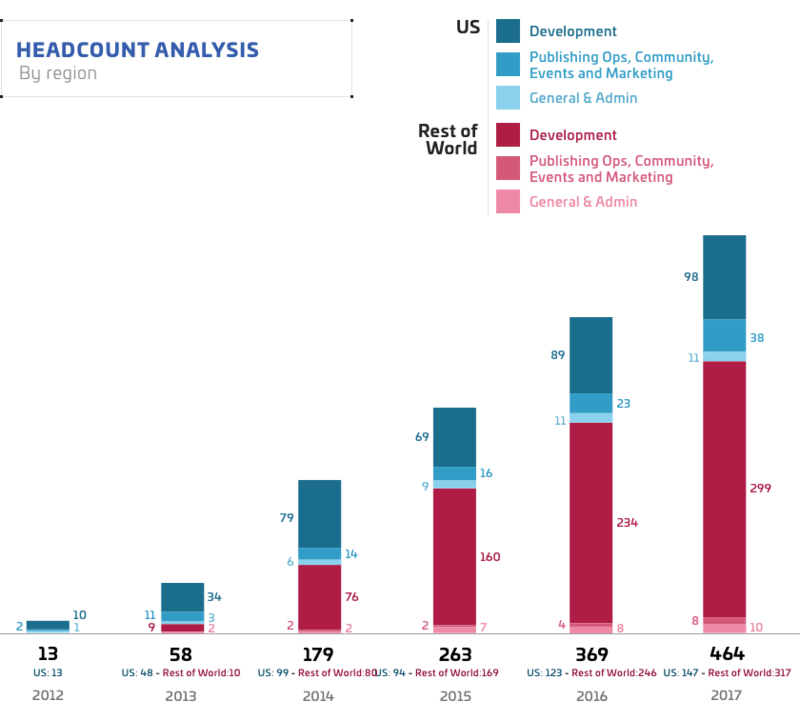 These costs are associated with publishing the game. This includes running game online services, customer support and marketing; including the cost of the RSI platform data hosting, content delivery and server costs. It also includes sales collection and player relations costs. 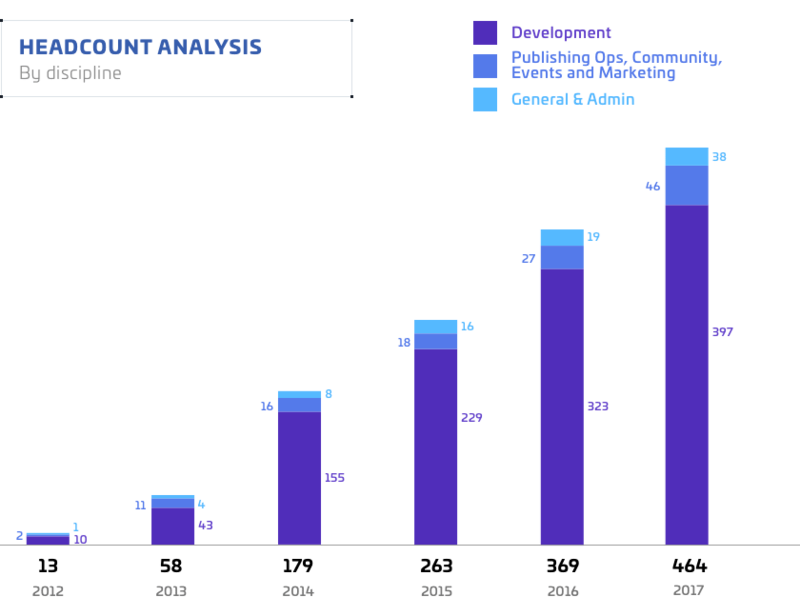 Most of these costs are concentrated in the US where the development operations and community communication and engagement activities are focused, particularly following the development rationalization referred above. Clearly, there is a cost in delivering this substantial game to our community and whilst we carefully manage our server and deployment costs and develop technologies for increased efficiencies, this cost will increase as we deliver to more and more players. The engagement with our community is also, of course, a direct consequence of our open development ethos, which has taken us to where we are today, and our events are growing in size and attendance. Consequently, it is not surprising that costs in this entire cost category are rising, climbing to $7.1M globally by 2017 and are likely to continue in that direction as we prepare for releases. These costs represent insurances, accountancy and other professional and legal fees not apportioned directly into the cost areas identified previously. Whilst such costs move with the scale of the operations external events and activities have a significant influence. This represents capital expenditure in areas such as hardware and software, fixtures, fittings, and office refurbishment and build out. It is heavily influenced by staff numbers and hardware renewals as well as server upgrades and other infrastructure costs required for the efficient deployment of the game. Whilst this is capital in nature it is included in this accounting as it represents an outlay for the materials required to develop and publish the game. By including the total capital expenditure amount here, the depreciation element of the expenditure is obviously excluded from the cost lines above. Initial infrastructure spending incurred in 2013 to 2015 contributed to a rising capex figure peaking at $2.7M globally for 2015. It has fallen back since, tracking new internal hires and team growth, which will remain the pattern until our continued growth in customers and operations requires another stepped increase in infrastructure expenditure. The headcount analysis at the bottom of the accounting is added to help understand the figures above. It represents the employees working under the noted disciplines as at the end of the year in question (it is not average people numbers for the year). There is not a one-to-one map of people numbers to the cost lines listed above. The analysis does not apportion out people costs into the cost areas (except community and marketing costs which are segregated). However, we highlight them because they represent our most significant cost line, and our employees also constitute our most valuable asset and the key to the long-term success of the business. Importantly though, the staff number analysis provides a guiding narrative broadly explaining the composition of our internal headcount, geographic concentrations and growth areas. As noted above the number and composition are a function of the efficiency of operation and cost effectiveness, given the life stage of the business and nature of our operations. Overall, the accounting demonstrates that the Group is diligently spending the money we are collecting from our backers and customers on the game development and publishing, as set out from the beginning. There is not a direct annual correlation of our spend to our net income. A buffer arose in the early years as we wrestled with the scope of what our customers wanted, and whilst we accelerated early deliveries through third-party contracting, we were cautious with our growth and expenditure until we could better define what was needed. Since the scope of the production has become better understood, we have been able to plan our growth and optimize our areas of expenditure while still evolving based upon our open development ethos. This allows us to focus in on the detailed areas and key technologies and content that we believe will make this ground-breaking production a great success. For and on behalf of Cloud Imperium US, LLC and Cloud Imperium UK Limited.